Are you an author looking for someone to review your recent or upcoming release? If so, I may be able to help you out. This blog is not solely dedicated to book reviews, but I do publish a book review on the fourth Thursday of every month. I would love to talk to you about making one of those reviews yours. Current status: NOT ACCEPTING REQUESTS until August 2019. Genre(s): Science fiction - anything from hard science fiction to steampunk to scifi romance. As long as it falls into scifi or one of its subgenres, I'm happy to check it out. Type: Short story collections, novellas, and novels. Sorry, no short stories on their own. 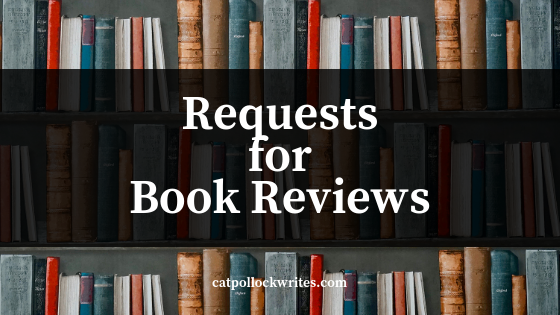 Send an email to catpollockwrites(at)gmail.com with the subject line "RE: Book Review Request - [Name of Book]". Please include the following information in the body of the email. Will you let me know if you decide to post a review? I will try to let you know either way, but I also have a day job and may not be able to email you as soon as I've made the decision. If I do write a review, I will email you with the link to the review and when the review will go live so you can read it and share it across your social media. Even if I don't decide to review it, I'd still like to give your story a shout-out on Facebook and Twitter when I share other science fiction writers' book links on Tuesdays. In that case, I'll get in contact with you about coordinating when would be best to do this. Just send me an email, and I'll do my best to clarify anything that may not seem clear.